Takeda-Ryu Nakamura Ha, which was founded by Nakamura Hisashi Soke who passed away last July, is one of the three Ryu-Ha which practises a match style of Aikido. 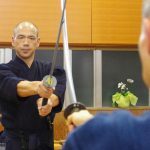 Takeda-Ryu Nakamura Ha teaches Aikido, Iaido, Jodo and this Ryu-Ha is appraised within Japan and also in foreign countries. The first training trip of Nakamura Shuji Okuden Shihan, who is in process of succeeding Soke in the near future, finally happened. Here we would like to report on the training trip. NSR Europe and North Africa headquarter of Takedaryu-Nakamura ha is located in Izel (Chiny) in the south of Belgium and near the Luxembourg border. 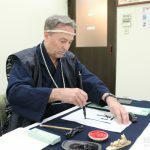 The head of the European Headquarter is named Valmy Debot Okuden Shihan and he lives in a relatively big house which is built right along the River, Semois. This house is used for their own living and also as a pension for renting. He built a nice dojo with 40 Tatamis, and he teaches also there constantly. 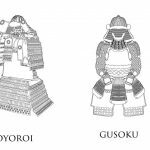 There are three important members around Debot Shihan: Corinne Joden Shihan, his wife, Bernard Okuden Shihan and Xavier Okuden Shihan. The 4 form the brain of NSR Europe. 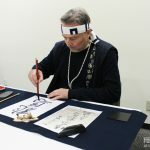 As they believe that members in foreign countries shall brush up their techniques by learning from Japanese senseis, at least once a year, they therefore send us an invitation to dispatch a delegation of Senseis. This year, the delegation was led by Nakamura Shuji Okuden Shihan, who is the son of our deceased in July Nakamura Soke and is in the process of succeeding the late Soke. Ono Yasumasa Joden Shihan and myself were named to assist him in the training. Kachi Takami san, interpreter, also joined us. The training was scheduled from 08 May to 14 May. Lufthansa planes took us smoothly from Haneda to Luxembourg via Munich. The delegation was welcomed by Debot Sensei himself at Luxembourg Airport and he drove us to his ‘Kawabe no Dojo’. (‘Kawabe no Dojo’ is the name of his dojo and it means the Dojo located along the river Semois). About 30 minutes after we had settled into our rooms, we got together in the living room again. We had celebrated our safe arrival by drinking Orval bier with a glass designed to drink with. We discussed our training plans eating Sushi being delivered from a Japanese restaurant in Luxembourg. We went to bed only after 11 p.m. which was 6 a.m. Japan time. Here, I have to add that during the time we were on board from Haneda, Nakamura sensei had discussed constantly about our training menu with Ono sensei sitting next to each other except when they watched a video-movies or fell asleep. The training was to start on 10th at the Adeps Sports-Center in Chiny which is situated about 5 minutes by car from Izel. This was the beginning of the training for Nakamura sensei. Before arriving, we were told that there should be no training planned on 9th. We, therefore, planned a relaxed day but the day we arrived, we were told that they would like to have from Nakamura sensei a special training for senseis, teaching or learning in Izel which he kindly accepted. In the early morning at 6 o’clock on 9th, the mobile telephone of Ono sensei made a big sound and this woke him and me up as we were sharing the same room. This was a call from Nakamura sensei to both of us, asking to assist him practicing 5th Dan Waza for the training that evening. In the evening, some senseis and students including Debot sensei totaling 7 gathered in the ‘Kawabe no Dojo’ and the special training started. Ono sensei and me as Uke. All watched intensively while Nakamura sensei explained the important points and repeated the techniques. 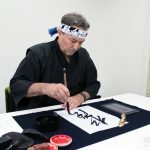 After his demonstration, all participants practiced the techniques while Nakamura sensei and Ono sensei checked and corrected. He went on demonstrating to Daito-Dori, Tachi-Dori and 4 Dan of Iai. Nakamura sensei was very enthusiastic and taught intensively. We think all the participants were very happy to be trained. 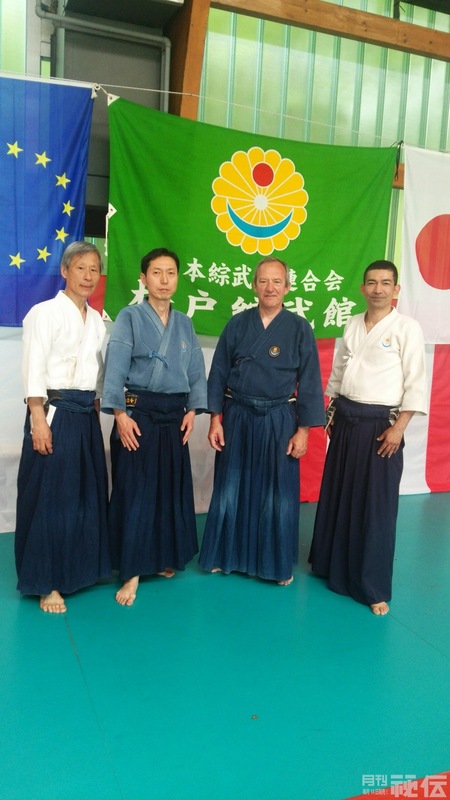 The idea of Nakamura sensei for this training trip was to encourage the members of NSR Europe to fight equally against the members of NSR Japan. In the early morning at 6 a.m. on 10th the mobile of Ono sensei rang again. Again, that morning, Nakamura sensei practised his training menu with Ono sensei until breakfast time. Debot sensei and I watched their practice intensively at the corner of the Dojo. Precisely at 10 a.m., Debot sensei drove us to the Sports-Center. As soon as we stepped into the gymnasium, approximately 80 participants started clapping to welcome us. Ono sensei led the start of the training by saying ‘Shomen Ni Rei’. On the wall of the Shomen, there were flags of Belgium, Switzerland, France, Estonia, Spain, Luxembourg, England, Austria, Czech Republic, Israel and Japan together with the flag of NSR. Unfortunately, due to the religious calendar, no one from Morocco could make it this year. Nakamura sensei together with Ono sensei stepped into the middle of the members in circle and started to show techniques: 6 techniques (Waza) each. He explained the details in Japanese only but his sharp movements and decisive explanations made the participants understand well. One day before the start of the training, most of them were instructed by Xavier sensei how to react at the practice time. When Debot sensei asked the participants to be in groups of 5, several groups were formed at once and the practice progressed smoothly as well. 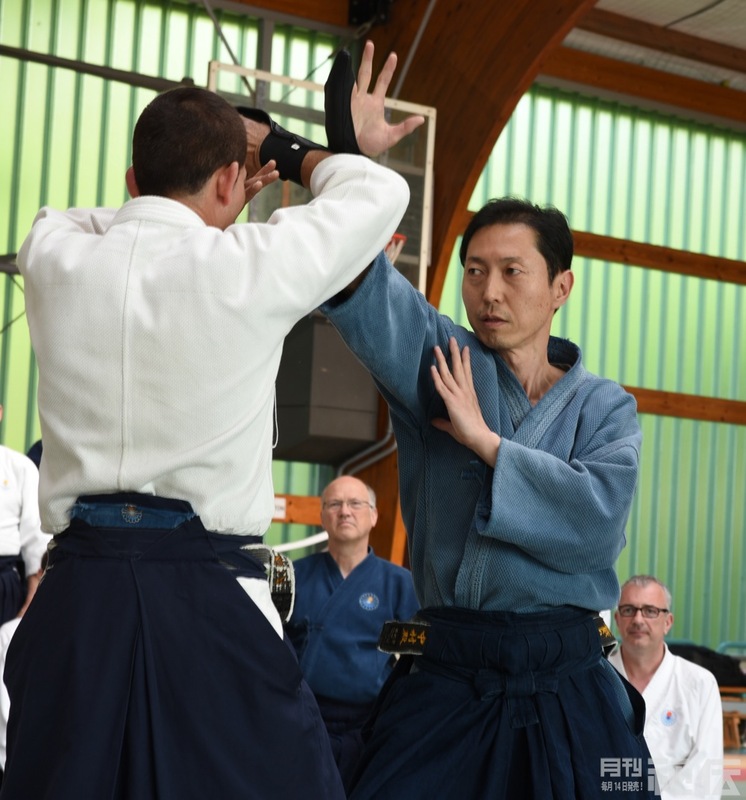 During the practice period, Nakamura sensei, Ono sensei and other European senseis checked around and gave advice for improvements. This was done the same throughout the practice and repeated until noon. After almost two hours of training, Debot sensei drove us back to his house and we took our lunch at the pool side of his terrace. Corinne sensei and Debot sensei themselves prepared the food for us and they cleaned up dishes before going hurriedly back to the Sport-Center. 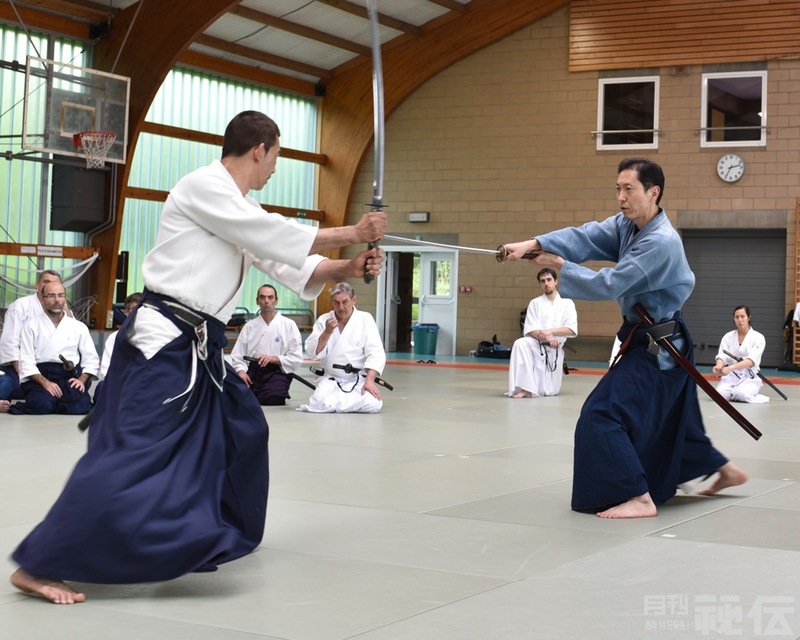 The practices in the afternoon were Iai from 1.30 to 3 p.m. Jodo from 3:30 to 4:45 and there was the judge-training for Shidoin senseis from 5:00 to 6:00 p.m. The first day of the trainings ended finally with no one injured. On the 2nd day, for Aikido Lessons, Nakamura sensei showed Kihon-Uchi and -Uke. In order to have a lesson for senseis to improve in Shinpan（judgement）at the match, Ono sensei and I demonstrated the Sogo randori shiai with mistakes and/or without. Nakamura sensei showed how to judge with this demonstration. After some demonstrations, lessons continued by assigning all senseis into Shushin (main judge) and Fukushin (sub-judge). With this set-up, both senseis and participants gained experience in Sogo randori shiai. Both Nakamura sensei and Ono sensei went around and gave advice wherever correction was needed. We told all that they should not fight too hard as the main theme was for correct judgement but many fought seriously. Maybe they wanted to show off in front of Nakamura sensei. 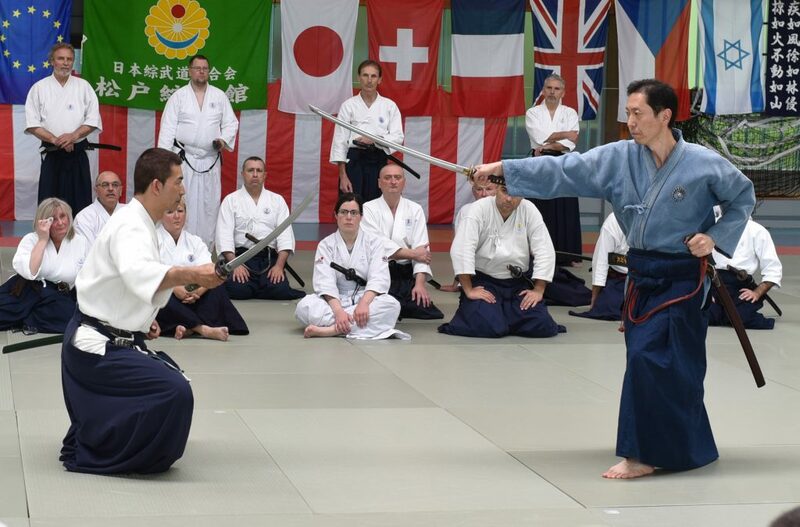 Nakamura sensei planned this training for the participants to be able to fight against Japanese members equally in Japan. He started to teach from the Kihon Waza (basic techniques) and then onto the Henka Waza (advanced techniques). After going through the 4 days training, he expected the European members to become fit for fighting in Sogo and Toriwaza. During the Jodo training, there was a little injury. At the Torijo training, one of the male members received a hit at his eyelid from one of the female members and it started bleeding. But he was lucky as the partner was an emergency doctor and he received an emergency treatment right away. He continued of course practising without problem until the end of the training day. Luckily, this small accident was the only one we had during the entire period. After 3 days of training, Debot sensei had organized the official reception at the City Hall of Chiny welcoming all senseis, with the Montsuki/Hakama and members including some family members. Each time the same but at this reception we, the Japanese senseis were to offer Sake, which we had brought from Japan, to all members one by one. We asked Nakamura sensei to start from the center area. Then Ono sensei started from the table at the entrance side and me from the other. Here, we should introduce Yaron Harary Okuden Shihan from Israel, who is considered to be the 3rd Arrow after Nakamura sensei`s delegation and the team of the Debot Okuden Shihan. He arrived at Narita, Japan 31 years ago looking for a strong Budo to master. At the information desk at the Airport, he found Takeda-Ryu Nakamura Ha and decided on the spot to learn it. He went right away to the Honbu Dojo and from that day he stayed in Japan and practised Aikido, Iaido, and others for 16 years. He has now his own Dojo in Israel and teaches there. 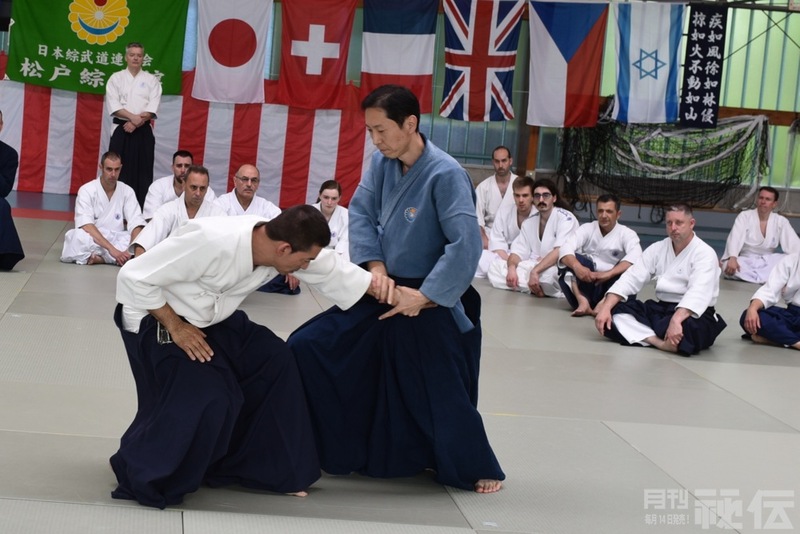 At the training this year, Nakamura sensei led the training for 4 days but from the 2nd day, Nakamura sensei assisted by Ono sensei gave lessons to grades higher than Shodan and Yaron sensei assisted by me took care of the beginners and similar levels. He speaks Japanese well and we think he can understand the Japanese way pretty well. Therefore, his way of teaching was outstanding. 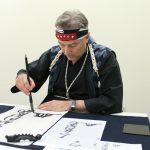 In addition, whenever Nakamura sensei showed his techniques in front of all, Yaron sensei stepped in and explained the important points clearly when it was necessary. I think his support in this way made the entire training successful. 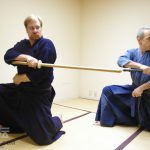 During the Jukenpo session, we noticed that a number of participants had already left for home and most of the still remaining participants were completely exhausted from the hangover of the party and Karaoke the night before. Thereafter, we decided to shorten the training a bit to avoid accidents and this meant that the 4 days training was over with a big success. After the training, we went back to the ‘Kawabe no Dojo’ for a short rest. We then went to Rochehaut which was about 35 minutes by a car for dinner. In this village, there are numbers of restaurants and museum that are operated by the sister of Corinne sensei and her husband. In the wine cellar, they have more than 40,000 bottles of wines and champagnes. In that cellar, we could taste different wines with smoked ham sliced in front of us. One can also experience this tasting tour by making a reservation in advance. At the dinner table, Corinne sensei informed us that the training conducted by Nakamura sensei was highly welcomed by most of the participants. Especially, this was clearly noticed when Nakamura sensei stepped into the center of the participants gathering around him. His performance with his Japanese explanations made all watch him with concentration. Therefore, we can say that this year’s training was again very successful. 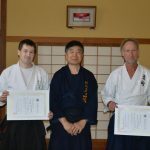 Last: late Nakamura Hisashi Soke put his first step in France and Luxembourg about 31 years ago to teach his techniques to European people. 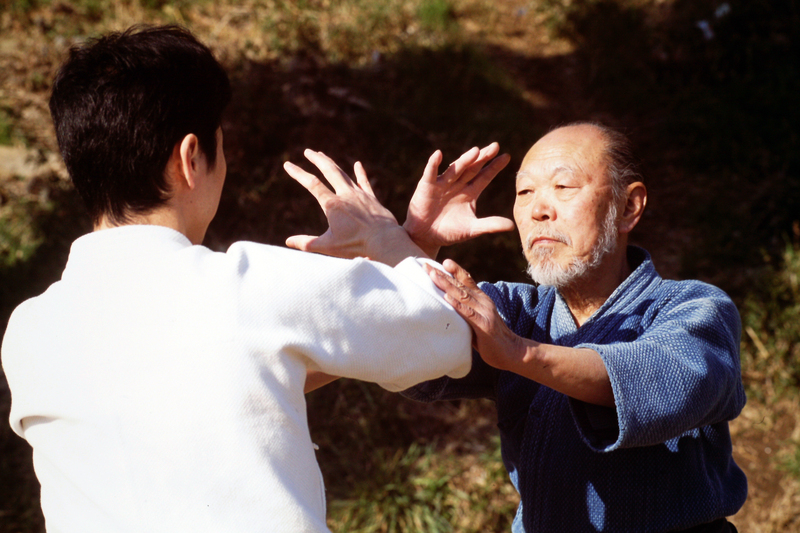 It is wonderful that this Aikido of Takeda-Ryu Nakamura Ha is still learned by so many people here in Europe! I would like to close this report on the first training trip of Nakamura sensei hoping that we can continue the training tour every year. p.s. Please note that we were very thankful to Debot sensei for the invitation for the training and also for the hospitality during the training period.